When I was fifteen I first glimpsed Mount Pleasant’s sweetgrass basket weavers. My aunt and uncle lived in Summerville where I spent two weeks each summer. We went into Charleston almost daily. Often we went to Mount Pleasant. Back then, not long after shooting across the Cooper River Bridge we arrived in a countryside peopled by weavers. They sat in pairs and sometimes threes along Highway 17. Now sweetgrass to me was a grass Mom introduced me to back in Georgia. It looks like the synthetic grass you see in Easter baskets. Pull a handful up close to your face and you’d smell the sweetest incense, but it would never do for baskets. Much too soft and fragile, thin too, like the synthetic grass in Easter baskets. The ladies sitting along the highway I would learn years later were weaving a tougher kind of sweetgrass, and in time their classic baskets would give a seven-mile stretch of highway a name—Sweetgrass Basket Makers Highway. Things were more picturesque then. Wearing large hats to ward off the sun the ladies sat far off the road patiently weaving, waiting for buyers. They looked like the women in a Jonathan Green painting, white dresses, white hats with wide brims, and stately demeanors. The road was quainter too. Highway 17 was a two-lane highway back then with generous grassy shoulders and all manner of development had yet to arrive. Today the daughters and granddaughters of the women I saw carry on the tradition but the circumstances have changed. Highway 17 today is a six-lane highway with narrow shoulders and heavy traffic. Restaurants like the Mellow Mushroom and bricked malls sprawl along its right of way. What was once a quaint corridor looks like your typical urban sprawl. The din of traffic, growling mufflers, blaring horns, and whining tires destroy serenity. Sirens bring an ominous sound to the mix. Cement mixers, eighteen-wheelers, buses, and cars fly by mere feet from the women. Stand in front of some stands and take two steps back and a truck will rip off your backsides. Catastrophe is one blown tire, one careless text away. Medals should honor these courageous women. The weavers who sit in the bricked in confines of the old slave market, sanitized and reborn as City Market, face no such hazards in this partially air-conditioned place devoid of its original character. The weavers risking their lives along Highway 17 earn my admiration. 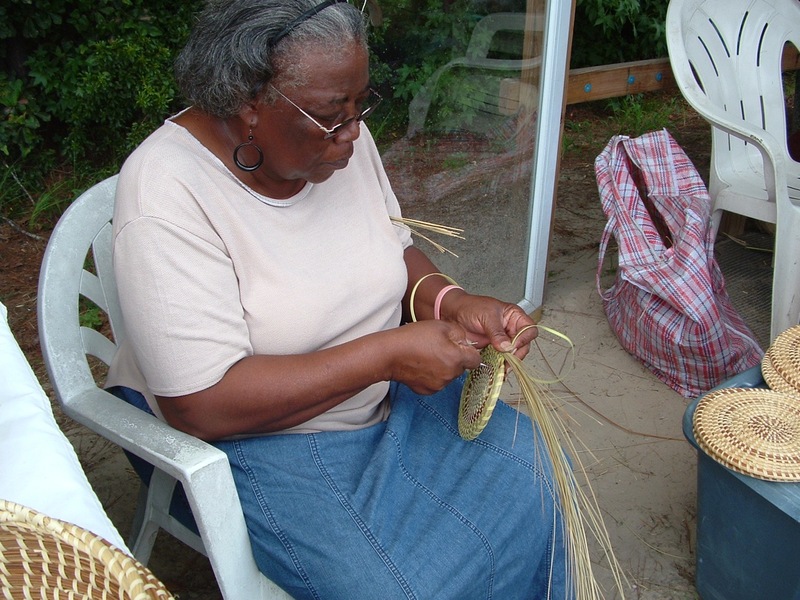 Charleston’s sweetgrass basket weavers are legendary. They are as much a part of the Lowcountry as she crab soup, Spanish moss, sea oats, and a crashing surf line. Their baskets please the eye with their symmetrical lines and khaki and tan patterns. A princely sum will buy you a basket but if you think spending $1,195 for a hand-woven basket is too much, hold on for a bit. There’s much to know about that basket and all that goes into it. For starters a rich history attends sweetgrass baskets. 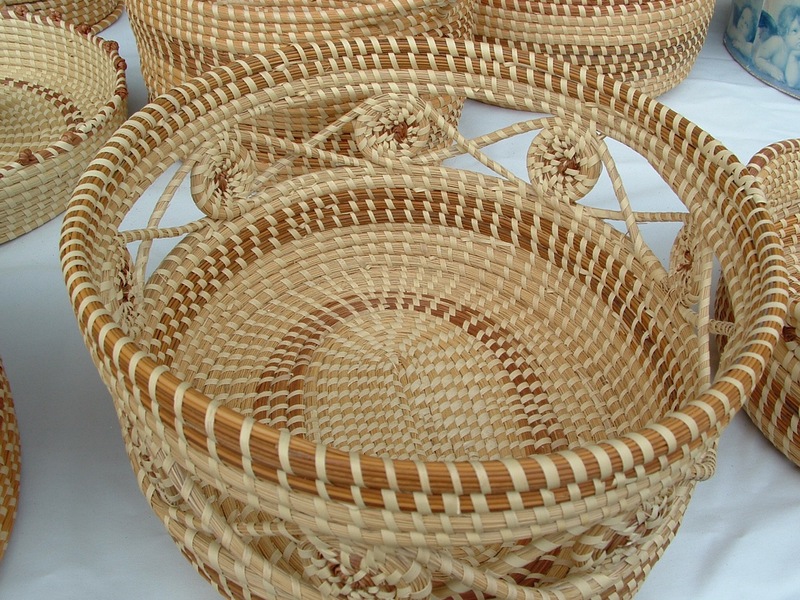 The weaving of sweetgrass baskets is an American art with African origins. 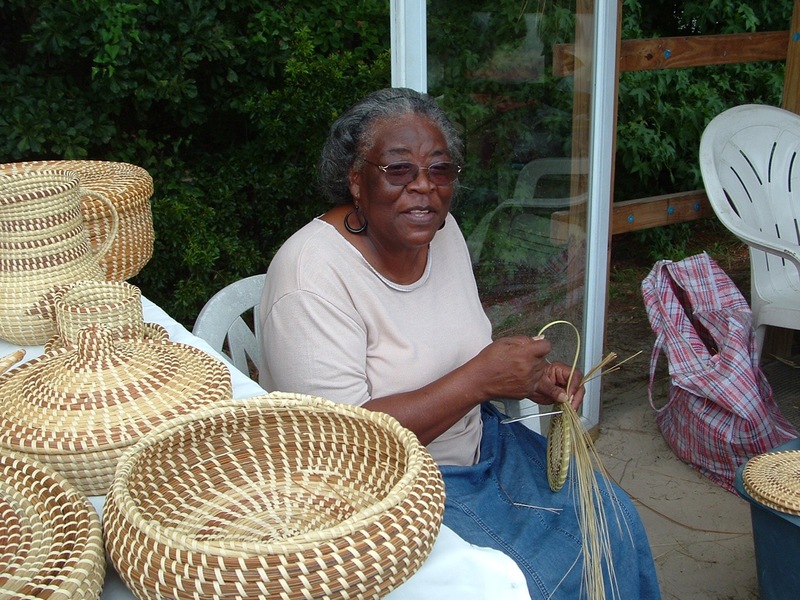 When slaves came to South Carolina from Sierra Leone they brought basket-making skills with them. 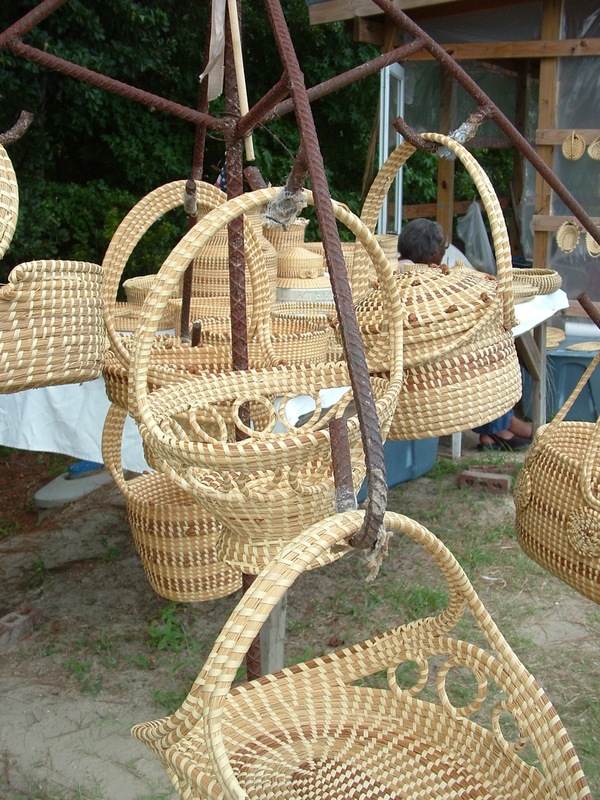 They made baskets from bulrush, white oak, and saw palmetto. 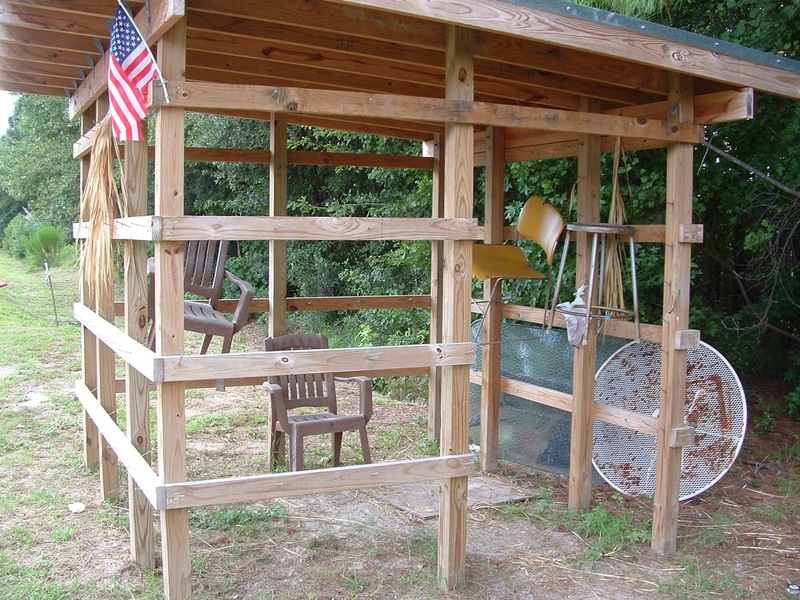 Rice plantations found many uses for their baskets. 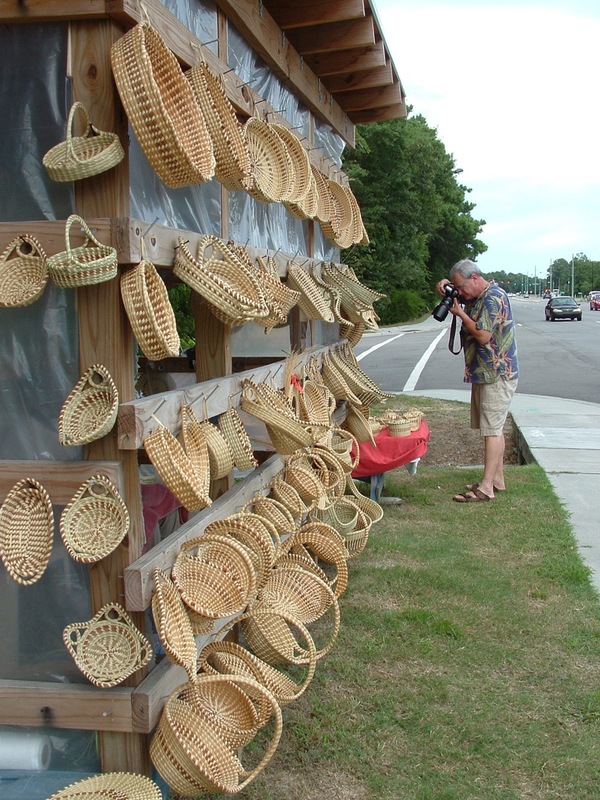 Sweetgrass grew in popularity at the beginning of the twentieth century when women in Mount Pleasant began making “show baskets” for tourists along Route 17. It began with the 1929 opening of the Grace Bridge that connected Charleston to Mount Pleasant. An idea struck Lottie “Winnee” Moultrie Swinton. She decided to sit in a chair with her baskets along Highway 17. People saw her beautiful work, pulled onto the shoulder of the road, and a tradition was born. Today the stretch of Highway 17 near Mount Pleasant is officially designated the Sweetgrass Basket Makers Highway. Up and down the road, on both sides, ladies sit, weave, and patiently wait to sell their wares. The highway needs them. Any charm the highway has comes from the women but there wouldn’t be much time for making baskets if weavers gathered their own grass. Men harvest it and sell it to the weavers. Pullers slip the grass from its roots and dry the fresh grass in the sun. Once it’s cut into sheaves it’s ready for weavers to work it into coils. Lots of labor here. Enough to go around so much that I have a job for you. 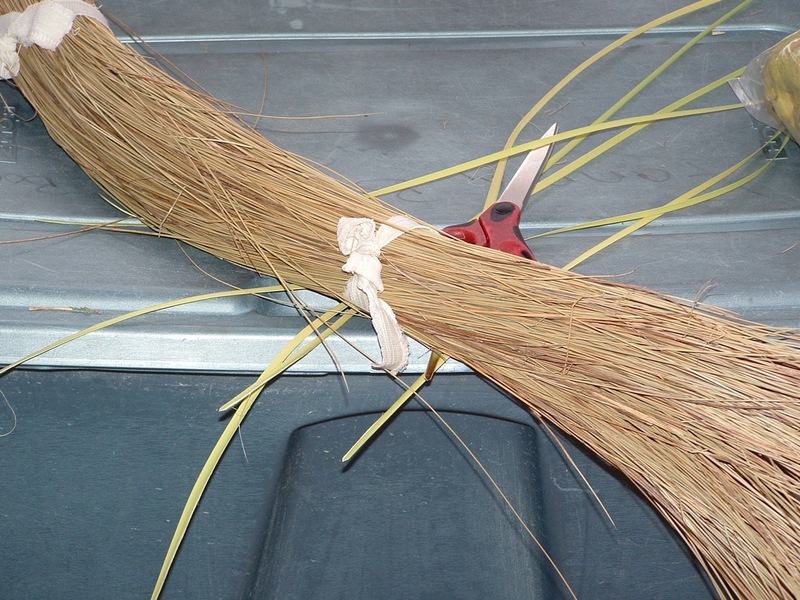 Your task is to harvest the elusive sweetgrass. Most folks fail to notice this ordinary looking plant much of the year, but come autumn its vibrant pinkish-purple plumes are unmistakable. Fall’s here and off you go to the old haunts where you’ve always found grass. But! More and more of it is behind gated communities. Go there and you risk being accused of trespassing. Your trips afield take you farther and farther away. For days you have no luck. At long last you find a secluded stretch of beach that somehow has eluded development. It’s late afternoon. Sunlight slants in low and your elongated shadow stretches toward the surf line. Looking back to the west the sun backlights clumps of a long-stemmed rosy-pink plant. Billowy and luminous, it blazes as if afire. It’s what you seek. Muhlenbergia filipes, what locals call purple muhly grass, the legendary sweetgrass weavers must have. Elizabeth and her sister Mabel, (Elizabeth calls her May) sit in a stand off 17’s inbound lanes to Mount Pleasant. Their voices are soft, their words measured as if they’re timing them to the stitches they make. A green-and-white cement truck barrels by. A three-foot strip of grass and a four-foot sidewalk are all that separate them from the truck and its spiraling mix of cement. The plastic nailed to the stand flaps and rattles every time a truck roars by. Come winter the plastic will keep the wind out, but it doesn’t mute traffic noise nor is it any protection from an out-of-control car. “Do you worry about getting hit by a truck, “ I shout to Mabel. “Every hour of every day,” she says. The women work from 8:30 to 6:30 seven days a week, weather permitting. “Last summer was too hot. We stayed in the shade,” says Elizabeth. Mabel, who prefers that her photograph not be taken, works on a small basket. “How long does it take to make a basket like that,” I ask. (I’m thinking a day maybe.) A musical laugh best described as wind chimes escapes Mabel, a shy lady according to her sister. “I’m on my third day. I’ve got five more rows to go, so I’ll have four days in this basket,” she says. Four days of sitting by this murderer’s row of traffic. “You get used to it,” says Elizabeth. “You saw my mother and aunt,” says Elizabeth. I had just told the ladies about seeing weavers back in the early 1960s. “If you saw weavers you saw them,” she says. The sister’s aunt, Katherine Cooper Johnson, taught them to weave. Their aunt, they say, was a perfectionist. “If I made a mistake my aunt would take the whole thing apart and I’d have to start all over,” says Elizabeth. “Getting a basket started is the hardest part,” says Mabel. “Weaving baskets is so hard it’ll make you cuss,” says Elizabeth. “Damn this is hard.” To this day the women start over if they make a mistake. “That’s how we were taught,” says Elizabeth. Once a basket is off to a good start it becomes a matter of patience, skill, and technique passed down from generation to generation. The women sit and weave, working their filed-down spoons. Slowly a work of art forms whose symmetry, precision, and alternating colors give sweetgrass baskets their classic appearance. “Longleaf pine needles give the baskets their brown rings. We add bulrush too,” says Mabel. “Comes from the marsh.” As we tried to talk over the din of traffic I did a rough count of baskets. About 120 baskets were on display, many of complex construction … My guesstimate is that more than ten years’ work is on display, a Herculean amount of weaving, a small fortune. A cell phone rings, seeming way out of place among the baskets and sheathes of grass. Elizabeth announces that she has to leave early to go to her church where she works part time. I offer to help her load her baskets but she declines. Technology has entered weavers’ roadside huts but basket making remains as it was when it came over from West Africa. The biggest and worst changes come from modern life. Gated communities choke off access to the grass and widened highways and ongoing development squeeze the women into a narrow zone. That thin line running from stall to stall along the shoulder? Call it the twilight zone because sweetgrass basket weaving could be approaching its twilight. The weavers are dying and the grass is harder than ever to get. Still, a glimmer of hope exists. “A lot more young people are into weaving,” says Mabel. That’s good. We need weavers. Their baskets, borne of loving labor, remind us of those days long ago when form gave function a beautiful way to accomplish tasks. Separate that chaff … hold those vegetables … carry those shellfish … make life easier. And what can be said about Elizabeth and Mabel? Well they have worked all their lives making baskets down by the Sweetgrass Highway just two miles from Hamlin Road. That’s where they grew up. In an era when people jump all over the country like cash-crazy crickets chasing the almighty dollar, these sisters have stayed the course, living and working just as their predecessors did. Cynics might say they had no choice but I disagree. One thing we all can agree on is undeniable. Life would be less beautiful without them.